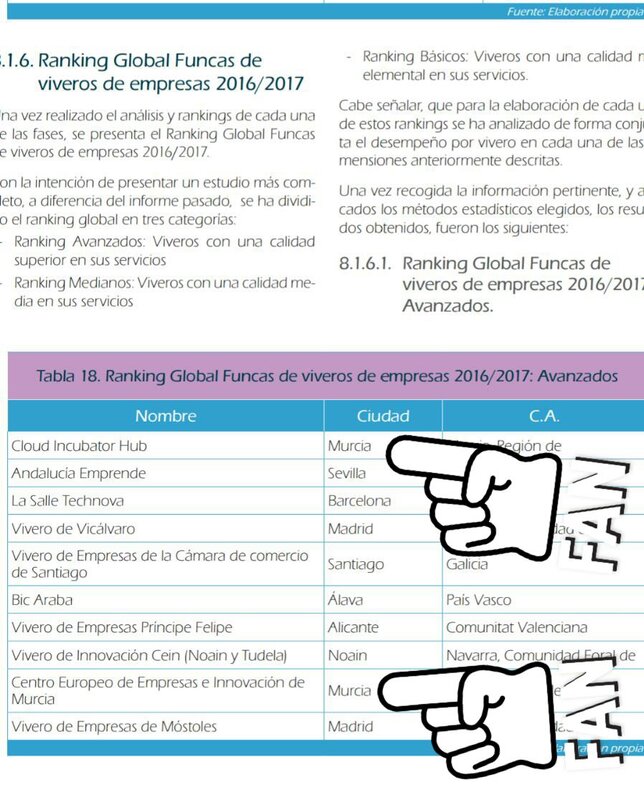 Cloud Incubator Hub (Murcia) was the best business incubator in Spain in 2016, followed by Andalucía Emprende (Seville) and La Salle Technova (Barcelona), according to the 2016/2017 Ranking drawn up by FUNCAS [Savings Bank Foundation] and King Juan Carlos University. Both institutions looked at the current situation for business incubators in Spain and, for the first time this year, business accelerators too, as catalysts which develop the country&#39;s business landscape. This, in a context where, over the last several years, entrepreneurial activity has become a driving force for the economy and a key element adding to innovation, competitiveness and growth. These initiatives improve societies’ entrepreneurial abilities and are key to start-ups having a positive impact on economies, although they are fragile and experience a high failure rate. More than 20% of new businesses fail in their first year, 15% disappear in their second year and approximately 10% die off in their third year, suggesting that there is still a way to go to ensure better survival rates, leading to employment creation and prosperity. Incubators (training organisations enabling companies to grow and develop) and accelerators (short, intensive incubation programmes) are raising business survival rates to around 90%. In the 2016 study, 227 incubators were registered as operating in Spain, mostly in the Autonomous Communities of Madrid, Catalonia and Castilla-La Mancha, closely followed by Andalusia, the Valencian Community, Murcia and Castile and León. In contrast, Cantabria, Aragon, the Balearic Islands, Extremadura, La Rioja, Navarre, Ceuta and Melilla contained less than 15% of incubators. It is worth noting that regions like the Canary Islands, Castilla-La Mancha and Murcia continue to see large quantities of new incubators emerge, with numbers continuing to rise closer to those found in Madrid, Barcelona, Andalusia and Valencia. In short, the first signs of regional consolidation for this type of entity are appearing. The total number of incubators has decreased in comparison with 2015 due to attitude changes from public and private administrations that support entrepreneurship, which have seen quality favoured over quantity and organisations supporting entrepreneurs transformed or given new direction with the aim of avoiding too much overlap and making better use of resources. The study also highlights the fact that, increasingly, the largest companies, banks and business schools are carrying out different initiatives to create and develop new companies. Specifically, incubators promoted by private entities account for almost 30% of the incubators surveyed, compared to 24% the year before. Additionally, it is worth noting that 6% of incubators are the result of collaboration between different organisations, proving that there is burgeoning willingness to cooperate and create synergies. Spain has 73 accelerators distributed around the different Autonomous Communities, although there is a definite concentration in Madrid and Catalonia, followed by Andalusia and the Valencian Community, where more than 62% of these organisations are located. Orizont, Agro-Food Accelerator (Pamplona), Ship2B (Barcelona) and Demium Startups (Valencia) occupy the top three positions in the rankings. Accelerators are organisations designed to encourage businesses to interact quickly with the market so that they adapt and learn. That is, become agile companies. In Spain, they mostly have a private promoter behind them (67%). However, the positive effects they generate have aroused the interest of local authorities and public administrations in relation to tools such as technological innovation and regional development policies (21%). Cloud Incubator HUB está de enhorabuena al recibir el reconocimiento de la primera posición en el ranking global de viveros de empresas avanzados del estudio analítico “Los servicios que prestan los viveros de empresas en España. Ranking 2016/2017” realizado por la Fundación de las Cajas de Ahorros (FUNCAS) y la Universidad Rey Juan Carlos. Los siguientes segundo y tercer puesto corresponden a Andalucía Emprende (Sevilla) y a La Salle Technova (Barcelona), nuestra felicitación también para ellos, por su esfuerzo en la difusión del ecosistema emprendedor.